SafetyPro Plus 9G - Beats PowerMark Hands Down! When it comes to the SafetyPro Plus 9G versus the Brady PowerMark printer, there is no contest! The SafetyPro Plus 9G beats the PowerMark hands-down in print speed, supply costs, durability, compatibility and ease-of-use. 4" Print Speed: The SafetyPro Plus has a print speed of up to 4" per second! Large memory buffers make printing from your PC quick and easy. 1" Print Speed: The Brady PowerMark prints at only 1" per second. This means you'll be waiting twice as long for your labels and signs to print. The print buffer is also slower when used with a PC. 150' Vinyl / 1000' Ribbon: With the SafetyPro Plus 9G, you get 3 times the amount of supplies for a fraction of the cost! Not only do you save money, you save time because you don't have to reload as often. 50' Vinyl / 200' Ribbon: Smaller supplies means more loading and higher costs. Brady's PowerMark suppleis come on 50' rolls, yet cost almost as much as SafetyPro Plus 150' supplies. PowerMark costs more and gives you less. Steel Construction: The SafetyPro Plus 9G has a protective-coated steel casing that is designed to withstand even the harshest environments. 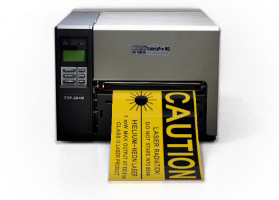 You won't find a more durable sign and label printer anywhere. Plastic Construction: The Brady PowerMark has a mostly plastic construction that can crack or break with impacts. Even with a plastic case, the PowerMark weighs more and takes up more space than the SafetyPro Plus. A Variety of Supplies: The SafetyPro Plus 9G offers vinyl and ribbons in multiple sizes and colors. We also offer die-cut materials, and can source custom materials to fit your need. You won't get that treatment from the PowerMark. Only Works With Brady Supplies: With the Brady PowerMark printer, you can only print using the supplies that they want to sell. In addition, the PowerMark is designed not to accept any other supplies, so custom supplies are out of the question. 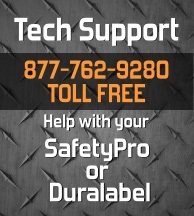 Standard Drivers and Software: With the SafetyPro Plus 9G, you can use the FacilityWare software package, MS Word, or any other software that can print to a standard driver. Your options for label and sign making are not limited by having to use any specific software! Proprietary Through and Through: With the PowerMark, you can only print using the built-in software or Brady's Markware software. Printing from your computer will cost you extra because you have to use their software. This also means you'll have to learn new software just to create signs and labels. Save Money Die-cuts: We can source die-cut labels with color components for any task, in any color set! You simply load the die-cut pre-printed supplies and add your custom text in any color. Save time and money, and get beautiful color signs and labels at a fraction of the cost. Expensive Color Ribbons: The PowerMark uses wasteful paneled ribbons to print colors. This means you get 1/4 the ribbon length, plus color labels take 4 times as long to print! You waste valuable time and money by priting marginal color labels with the PowerMark. We feel that there is no competition: the SafetyPro Plus 9G sign printer beats the Brady PowerMark hands down. Save time with faster print speeds, easier setup and quicker supply loading. Save money with 150' supply rolls instead of only 50' rolls with PowerMark. Get custom label materials and presidential treatment from a company that provides what the customer needs and wants at an affordable price.